Gitgit Waterfall locates about 90km from Denpasar in Singaraja. It takes about 45 min. by walk from the park to waterfall. The road is paved but there are stairs, and it is cool place, so recommend bringing sneakers and long-sleeve cort, etc. to be prepared. 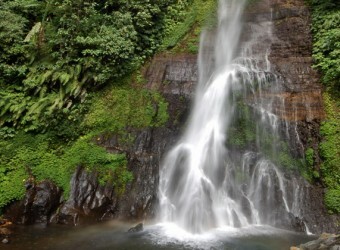 The height of waterfall is about 50m, and it is surrounded by forest and pure and cold water is flowing. It`s like a waterfall in the scene of the movie. I felt nature which is full of negative ions. It`s fresh! It was worth to make a little side trip there. A large waterfall, the waterfall splash were amazing! It is far, but I thought that it was good to go there. I was healed by fresh air and negative ions. Nature is great!